A stunning contemporary equestrian property, idyllically situated on the upper reaches of the River Medway. With 14 acres of grazing land this modern home benefits from 6 bedrooms, 4 bathrooms and substantial ground floor accommodation. Possible use of equestrian facilities include stable, grazing and floodlit menage by arrangement. Lower Gallants is a stunning contemporary equestrian property, idyllically situated on the upper reaches of the River Medway sitting well in 18 acres This substantial immaculately presented home benefits from 6 bedrooms including two on the ground floor, four bath/ shower rooms, bespoke beautifully designed kitchen / dining room, separate laundry room, sitting room with wood burning stove. Finished in Purbeck Ragstone with Redwood weather boarded elevations, the generous use of double glazed oak framed windows and doors flood the interior with light; seven sets of doors open onto the south facing terrace. The property additionally benefits from considerable river frontage with established fishing rights and mooring rights, subject to planning consent and/or license. LOCATION & HISTORY: Lower Gallants is located on the outskirts of East Farleigh, an historic village mentioned in The Domesday Book. Its position on the south side of the upper reaches of River Medway provided an excellent river crossing and the Grade I bridge, built in the Middle Ages is believed to be the oldest in Kent. It provided the crossing point for the Parliamentary forces in the Battle of Maidstone during the Civil War. The village 12th-century church is dedicated to St Mary, where two sons of William Wilberforce, were both vicars. The population of East and West Farleigh grew significantly in the early 1800's with the increase in hop production, which covered a quarter of all land in the parish including that of Lower Gallants. Hops are no longer grown in the parish and the last oast house in the village ceased operation in 1977. LOCALITY: Along with the church there is a village hall, primary school, four country inns including The Bull in the centre of the village and a regular farmers market. Further shopping facilities are to be found in the nearby county town of Maidstone some 2 miles away, which offers a wide variety of in and out of town shopping centres, supermarkets, theatres, cinemas, restaurants and bars. Positioned well for the commuter, East Farleigh railway station (some 1 mile away) provides services via Tonbridge to London Bridge, Waterloo, Charing Cross and Cannon Street. Maidstone East Station provides services to London Victoria in an hour or so. Tonbridge also connects to Ashford International which provides a fast service to St. Pancras and Europe. The Motorway network (M20) can be easily accessed at Junction 3 or 4 near Maidstone. Kent is renowned for the quality, choice and commitment to excellence of its educational system in both the public and private sector. Noteworthy schools in the area include: Sutton Valence Independent School (preparatory and senior) and the Maidstone Grammar Schools. Lower Gallants is also well placed for Benenden(girls) and Tonbridge(boys) Schools. DESCRIPTION: This modern masterpiece is located in a beautiful tranquil spot in the Kent countryside overlooking the River Medway valley. It benefits from a large garden area with large decked terraces, making the most of the wonderful views, a great place to entertain. RECEPTION HALL: 7' 5" x 14' 7" (2.27m x 4.45m). Ceiling height 7' 8" (2.34m). KITCHEN/DINING ROOM: 31' 0" x 13' 11" (9.44m x 4.24m). Ceiling height 7' 8" (2.34m). A beautifully designed bespoke kitchen with a feature Ragstone wall. There are ample windows and doors leading out to the terraces. Twin ceramic sink unit with mixer taps set into granite work surface. Central island with a curved wooden breakfast bar area. Range of quality handmade wooden fitted cupboards and drawers, dishwasher, fridge freezer and a range oven. Tiled floor with under floor heating. GARDEN ROOM: 12'0" x 11'5" (3.66m x 3.48m). Ceiling height 13'2" (4.01m). Double glazed windows and doors to both sides and rear. Vaulted ceiling. SITTING ROOM: 25' 9'' x 23' 11" (7.84m x 7.28m). Ceiling height 7' 8" (2.34m). Triple aspect with 3 sets of double glazed French doors. A stunning brick fireplace with a wood burner. Oak floor with under floor heating. LAUNDRY ROOM: 9' 9" x 6' 11" (2.97m x 2.12m). Ceiling height 7 '8" (2.34m). Stable door to garden. Space for 2 washing machines and dryers. Tiled floor with under floor heating. BEDROOM 6: 14' 1" x 11' 8" (4.30m x 3.56m). Ceiling height 7 ' 8" (2.34m). Double glazed French doors to the front. Oak floor with underfloor heating. WET ROOM: 7' 6"x 6' 1" (2.30m x1.85m). Ceiling height 7' 8" (2.34m). Walk in shower area. Tiled walls and floor. WC and wall mounted washbasin. STUDY: 10' 0" x 11' 11" (3.64m x 3.06m). Ceiling height 7' 8" (2.34m). Stable door to garden. Airing cupboard with hot water cylinder. BEDROOM 5: 19' 5" x 11 '9" (5.91m x 3.49m). Ceiling height 7' 8" (2.34m). Double Glazed French doors to the front. Oak floor with underfloor heating. 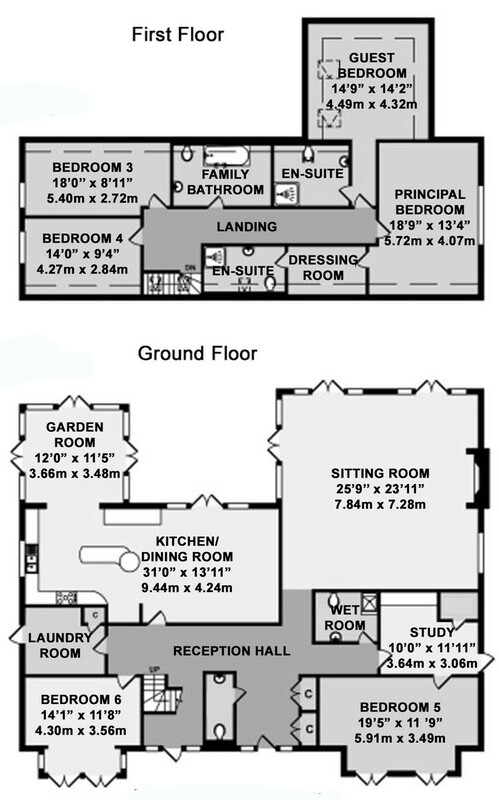 FIRST FLOOR LANDING: 10' 6" x 7' 2" (3.20m x 2.20m).Ceiling height 7' 9" (2.37m). Double glazed skylight windows. Fitted carpet. DRESSING ROOM: 6'5" x 7'4" (1.96m x 2.24m). Ceiling height 7'9" (2.37m). EN-SUITE SHOWER ROOM: 6' 5" x 7' 4" (1.96m x 2.24m). Ceiling height 7' 9" (2.37m). WC. Wall mounted hand wash basin. Corner shower enclosure. Radiator towel rail. Tiled floor. GUEST BEDROOM: 14' 9" x 14' 2" (4.49m x 4.32m). Ceiling height 7' 9" (2.37m). Two windows to the side. Radiator. Fitted carpet. EN-SUITE SHOWER ROOM: 9' 10" x 5' 10" (3.01m x 1.79m). Ceiling height 7' 9" (2.37m). Windows to the rear. A corner shower enclosure, WC, wall mounted wash basin and a heated towel rail. Tiled floor. FAMILY BATHROOM: 11' 9" x 7' 6" (3.58m x 2.30m). Ceiling height 7'9" (2.37m). Window to side. Radiator. Double ended large panelled bath for luxury relaxing soaks. WC, a wall mounted wash basin and a heated towel rail. Tiled floor. Window to side. fitted carpet. BEDROOM 4: 14' 0" x 9' 4" (4.27m x 2.84m). Ceiling height 7' 9" (2.37m). Window to the side. Fitted carpet. EXTERNALLY: The property is secured behind electric 5 bar gate, approached via a long private driveway with land on either side belonging to this family home. The driveway extends beyond the house towards a large gravelled parking area for several vehicles. The paddocks then wrap around the house to the front, rear and sides. Fabulous for entertaining, the property has a river facing decked terrace to front and large sand stone terrace to rear, with ample doors leading out from the reception rooms. The property backs onto the River Medway. We understand that fishing rights have been established. Rights to moor may be subject to a planning application and/or licensing. SERVICES: Mains electricity, water, private drainage and oil fired central heating. LOCAL Authority: Maidstone Borough Council. From the M20 - Junction 4 Exit: Proceed in a southernly direction towards Tonbridge, West Malling and Kings Hill (A228) Continue for approximately 4miles until reaching the Mereworth roundabout with the Tonbridge Road (A26) Turn left onto the Tonbridge Road towards Wateringbury and Maidstone. Continue through Wateringbury to Teston on passing through Teston turn right towards W. Farleigh (B2163) crossing the railway line and the river (Teston Bridge) continue up the hill to the T juction. Turn left onto Lower Road (B2010) Proceed along for approximately 0.75 mile and the property can be found on the left hand side.